Here are two household expense ledgers belonging to Aaron Lane Lanning, Melvern, Kansas. Early in his life, Aaron's parents moved the family to Jerseyville, Illinois where in April 1862, he joined the 122nd Illinois Volunteer Infantry. He was promoted to sergeant in 1864 and discharged in June 1865. After the war, Aaron, his parents and siblings settled in Mound City, Kansas. He married Sarah Emma Preston on November 3, 1867, and they eventually moved near Melvern, Kansas where he farmed. Aaron and Emma had five children. 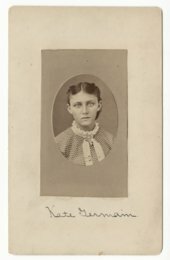 Abbie Bright at age 22 photographed in Cedar Rapids, Iowa.